Beautiful manicured pond with growing along the banksflowers, floating in the clear water and sparkling silver fish in the sun stones in a short time can become a dirty swamp overgrown with slime, if time is not producing clean it from time to time. There are several ways to rid the pond of debris and sludge, for example, the mechanical - but it takes a lot of time. Chemical technology will kill all life in the water, it is the best option - to use a vacuum cleaner to the pool, a special device for cleaning. The name "vacuum cleaner" in this case is not entirelytrue, as the unit has nothing to do with dust, so named by analogy with a household appliance. Like a home assistant, he remarkably clean contaminated surfaces, but instead of floor coverings and upholstered furniture it serves the bottom of the reservoir, methodically removing silt and debris. Due to the simple device of water underwater part of the pond becomes well-groomed appearance, the water becomes clear, and from the shore can be a long time to watch the active life of aquatic inhabitants. If we take into account the degree of human intervention in the management of water vacuum, it is possible to all known models divided into three groups: manual, semi-automatic and autonomous machines. The main driving force is a manual vacuum cleanerhis master. He chooses the site for cleaning and independently, but with the help of the device, removes dirt and mud. The simplest models are ideal for small-sized reservoirs, as the rod length is strictly fixed. several nozzles (net litter to the bottom of the brush). All components are assembled and joined withgarden hose. Hosed washes bottom mud and picks up dirt. For complete purification of the pond equipment is connected to a special filter. The treated water back into the pond, and the dirt remains in a special bag. 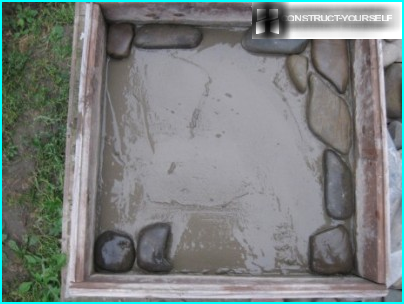 Thus it is possible to remove the sediment from the bottom of the pond walls and decorative objects that are in it: the stones, the fountain parts, water decorations. Light debris - leaves, dry twigs, grass - usually held on the surface of specially provided net for him. The nozzle is attached to the mesh instead of a brush on the end of the bar, and you can slowly remove all the excess that is floating in the pond. the ability to once again enjoy the contact with nature. 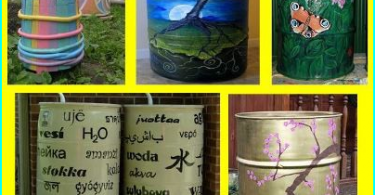 Disadvantages are important for people who are experiencing shortage of time: handmade take more than one hour, and it will have to be repeated with a certain regularity. Any automatic intervention - isregular convenience and more help to man. 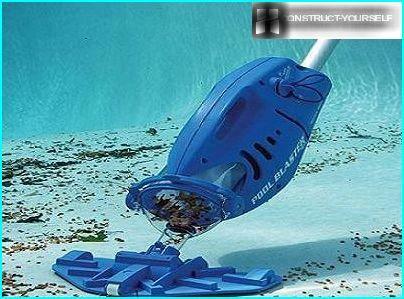 Externally semiautomatic water vacuums different attachment - more complex and functional vacuum brush. Moreover, apparatuses are arranged so that one can regulate the rate of flow of water passing. Most models of vacuum - this is the middle link between the elementary hand brush and autonomous robot vacuum cleaner. Pneumatic systems and filtration equipment ensure smooth operation of the machine, which moves erratically on the bottom, picking up mire and dirt. Special membrane-sucker holds the nozzle in one place, and then moves to another. 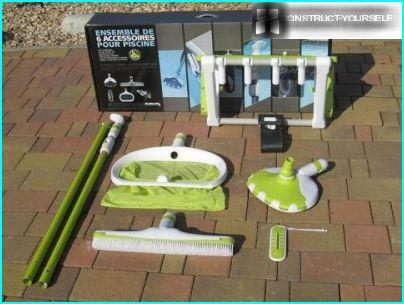 Plus purchase semi-automatic - the possibility ofponds use of different shapes and sizes. Installation should take into account the need to connect to the skimmer or to a bag to collect waste. Cleaning takes place much faster than by hand, but the control is still needed on the equipment operation. You can easily adjust the speed of the bottom of the processing, which manages a special valve. Semi copes with cleaning grooves and places to which it is difficult to reach manually. Naturally, the cost models of vacuum higher than the hand-held vacuum cleaners. 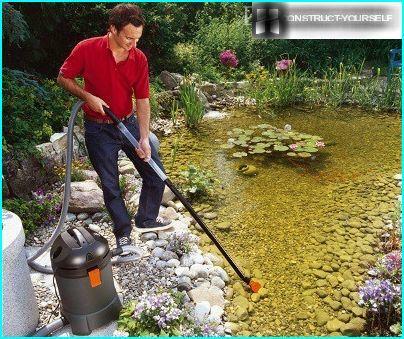 There are many reasons to buy itAutonomous vacuum cleaner to clean the quality of the pond, which is called a robot. Compact and beautiful models the appearance and manner of adjustment resemble children's radio-controlled cars - the same bright, functional and original. Not only that - they are more independent than toys, and does not require active human intervention. There are two basic ways to controlunderwater robots. The first is good, when the pond bottom is flat, has no unevenness and difficult bends. After switching on the device operates strictly according to the set program, carefully examining all the bottom and sides. The program is stored in the device memory, and the next time he will carry out cleaning again on the same route. The second method is optimal for the bottom with depressions and elevations. Hoover sent using the remote to the desired areas, it is also governed by the time finding it in the right, challenging for cleaning the site. Not only brushes, but all e-fillingIt is under water. The range of the device is limited by the length of the electric cable. The skimmer or other additional equipment does not need a robot, filtration system and the dirt tank located inside it. After each cleaning procedure is necessary to clean a vacuum cleaner, especially the filter. Easy to use, convenient and reliable,robot cleaners quickly won the love of summer residents. 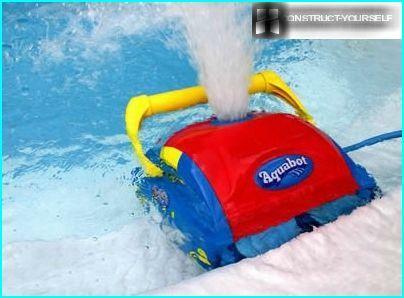 The price of machines is high, so for all their advantages acquisition of underwater toys not everyone can afford. On manual models, specialized CzechMountfield company. Kits for connecting to the skimmer sold flat packed and include at least the telescoping tube holder (2,5-4,8 m), bellows of different lengths and the brush head. Hose length may vary, but the average is 9 m or 12 m Cost of the -. 3500 rubles. Holders of picturesque ponds are probably familiar with the German machines for cleaning ponds company Oase. 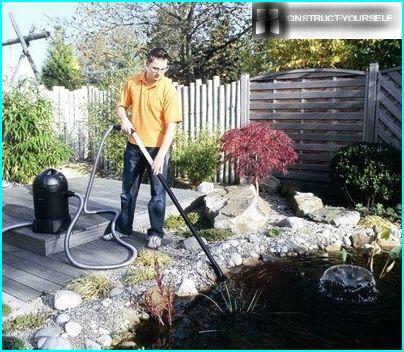 The majority of these are universal machines that serve for cleaning and ponds, and premises. Model Classic 1400 W power iscapacious reservoir for dust (27 liters) and a large set of nozzles, among which there are convenient tools specifically for cleaning cavities and crevices or cleaning of filamentous algae. 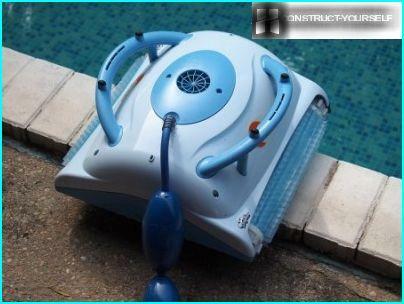 The device is equipped with two hoses: for the suction of water (4 m) and drain (2 m). The vacuum cleaner has proven itself when working to a depth of 2 m cost of the device -. 11600 rubles. The Israeli company produces quite Maytronicsexpensive but quality and reliable robot cleaners. 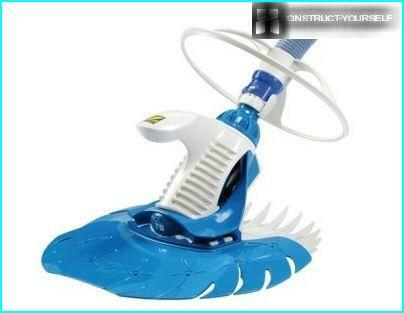 One relatively inexpensive - automatic Dolphin Galaxy, ideal for ponds with a flat, smooth bottom. Combined brush special shape (40 cm wide) and perfectly clean the bottom and corners. The device is equipped with a fine filter that holds the particles of dust and dirt of up to 70 microns. Price - 41000 rubles. Choosing a water vacuum cleaner depends on the availability of free time, the desire to spend more time outdoors and, of course, on the material possibilities.